On June 3, Japan Bank for International Cooperation (JBIC) has made a loan agreement of USD2,052 million for the Batang coal-fired power plant in Central Java, Indonesia (ITOCHU and J-POWER has invested in). FoE Japan and the other Japanese NGOs have carried out the urgent protest action in front of JBIC today, objecting strongly to JBIC’s decision, which ignores the voices of local people who have continuously opposed the project for 5 years and the concerns of domestic and international civil societies about serious human rights violations and environmental, social and climate impacts caused by the project. Japanese government and JBIC must immediately review the JBIC’s decision, sincerely taking them into account the voices of local people and the concerns of domestic and international civil society, before the livelihood condition and social situation would be getting worse at the local level. On June 3, Japan Bank for International Cooperation (JBIC) has decided to provide a huge loan of USD2,052 million for the Batang coal-fired power plant in Central Java, Indonesia (J-POWER and ITOCHU has invested in). 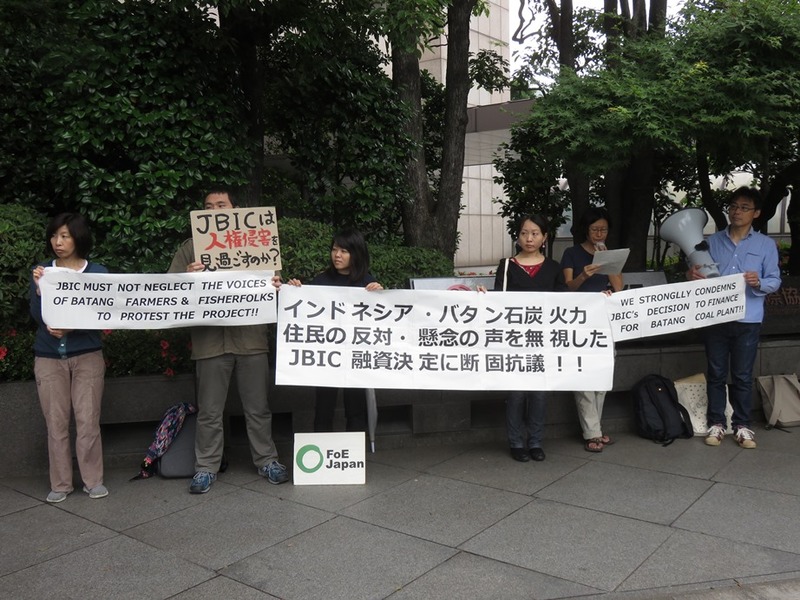 We strongly object to JBIC’s decision, which ignores the voices of local people who have continuously opposed the project for 5 years and the concerns of domestic and international civil societies about serious human rights violations and environmental, social and climate impacts caused by the project. Also, JBIC says in its press release that “it is Indonesia’s first ever IPP project of an ultra-supercritical coal-fired power generation, and introduces technologies which are not only efficient but environmentally-friendly.” However, even with USC technology, CO2 emissions are still twice that of natural gas, and the concerns about the other pollutions, such as air pollution of SOx, NOx and PM2.5 and thermal discharge, are remaining. Further, Japanese government announced the policy to provide more huge money for “Quality Infrastructure” export at the G7 summit last month. But we are expressing our deep concerns about the Japanese policy of “Quality” infrastructure export, which is promoted ignoring the issues of human rights, environment, and climate change, as this JBIC’s decision on Batang has revealed. On July 29, 2015, representatives of the local farmers and fishermen delivered an official objection to JBIC. In the submission, the local community pointed out how the project has failed and will fail to comply with many provisions of the JBIC Guidelines for Confirmation of Environmental and Social Considerations (the Guidelines), as it has made/will make their life worse and has caused/will cause violations of human rights. Since the objection, however, there have been no improvements on the ground. Instead, further cases of human rights violations have been reported from the local area. For example, the irrigation facilities for the unsold farmland were destroyed due to the land clearing work by heavy equipment of the Indonesian army, and PLN put up the one-sided and threatening signboard, mentioning the trespassing and the possible violation against criminal law, in the unsold farmland. In addition, the National Human Rights Commission (NHRC), an independent government agency in Indonesia, has recently issued the new recommendations (dated May 11, 2016) to the project proponents. In the recommendations, NHRC pointed out the problem that despite not having any “consent” of the landowners and farmers, all the access to the unsold farmland was blocked with the fences last March and that the farmers couldn’t harvest their crops. And NHRC demanded that the project proponents “provide the access to the farmland, so that the community can harvest their rice and the other crops, until they could reach the permanent agreement on land access and usage with the community.” NHRC clearly stated that if ever the project proponents fail to follow up this complaint, it could mean the potential human rights violation, according to the Article 36, Law No. 39/1999 on Human Rights. However, even after the recommendations, the project proponents have taken no concrete action. As a result, many farmers couldn’t harvest their crops and lost the income opportunity. This situation shows that the project proponents are violating the Indonesian law related to human rights, as NHRC pointed out, that they are also violating the JBIC’s Guidelines which stipulate “the compliance of host country’s law”. Further, in the recommendations, NHRC reminded that various human rights violations have occurred against the community since before in this project. As NHRC wrote in its letter to Japanese government dated December 21, 2015, “There are various human rights violations and abuses on the land transfer process since 2013, including intimidations and physically and mentally threats to the local community.” That is, serious human rights violations, which significantly prevent the democratic process, have repeatedly occurred in this project. The JBIC’s decision on Batang shows that Japanese government and JBIC neglected the situation that no “appropriate participation” had been secured in the agreements and the planning with the local people, which violates the Guidelines. Importantly, the recommendations mentioned on “United Nation Guiding Principle on Business and Human Rights,” where “The State duty to protect human rights”, including the involvement of export credit agencies, as well as “The corporate responsibility to respect human rights” are stipulated. Given that the huge loan from JBIC is inevitable for this project, Japanese government and JBIC have the critical duty to protect human rights related to the project. However, despite fulfilling the duty to protect the human rights under the international standards, Japanese government and JBIC have complicit in the serious human rights violations related to the project by providing the loan. Also, the local community filed the complaint to Japanese NCP on July 29, 2015, pointing out the violations against “OECD Guidelines for Multinational Enterprises” and demanded that Japanese NCP encourage the Japanese companies to take appropriate actions. But Japanese NCP hasn’t yet completed its initial assessment, which is supposedly finalized within 3 months. Again, this shows the Japanese government has failed to fulfill the duty to protect the human rights related to the project. At Batang, the community has been still expressing its opposition against the project and its intention to reject selling their own land at the tent besides the fence since the end of March till today. Also, the fisherfolk community is concerned about the impact on their fishing ground by the drilling work in the sea, which the project proponent has started since the middle of May, and has just taken a protest action last June 4. In the front of Japanese Embassy at Jakarta, around 3,500 peoples, including the Batang locals, protested the coal-fired power plants supported by Japan in Indonesia last May 11. In spite of no “social acceptability” for this project like these situations, JBIC accepted the forcible land acquisition under the controversial Law No. 2, which neglects the people’s determination, and decided to provide the loan for the project, which is clearly violating its own Guidelines. JBIC Guidelines states that “If, as a result of its environmental review, JBIC judges that appropriate environmental and social considerations are not ensured, it will encourage the project proponent, through the borrower, to undertake appropriate environmental and social considerations. If appropriate environmental and social considerations are not undertaken, there may be cases where funding is not extended.” Although JBIC directly heard from NHRC as well as the local people about the situations that there was no “appropriate environmental and social considerations,” JBIC still decided to provide its fund for the Batang project. This just reveals that JBIC lacks the intension and the ability to appropriately implement its own Guidelines. In addition, when JBIC monitor this project in the future, we have a big question whether JBIC could appropriately confirm the facts of environmental and social problems, or not, even though human rights violations or damage to the livelihood occur at the local level. 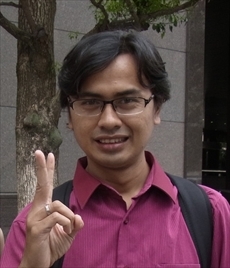 Japanese government and JBIC must immediately review the JBIC’s decision to provide its fund for the Batang project, sincerely taking them into account the above-mentioned voices of local people and the said concerns of domestic and international civil society, before the livelihood condition and social situation of the local affected people would be getting worse.